Beginning Fall 2017, the EUA has joined with Berkeley Connect to create a book club for all English majors, and anyone interested in English literature on Berkeley’s campus. All are welcome to join! Please come having read the material, and ready to discuss it in a fun and informal setting. This semester, EUA Reads will meet every Wednesday in Wheeler 400 from 4:00 – 5:00 pm. Please join our email list to find out about the exciting books and short stories we are reading each week! 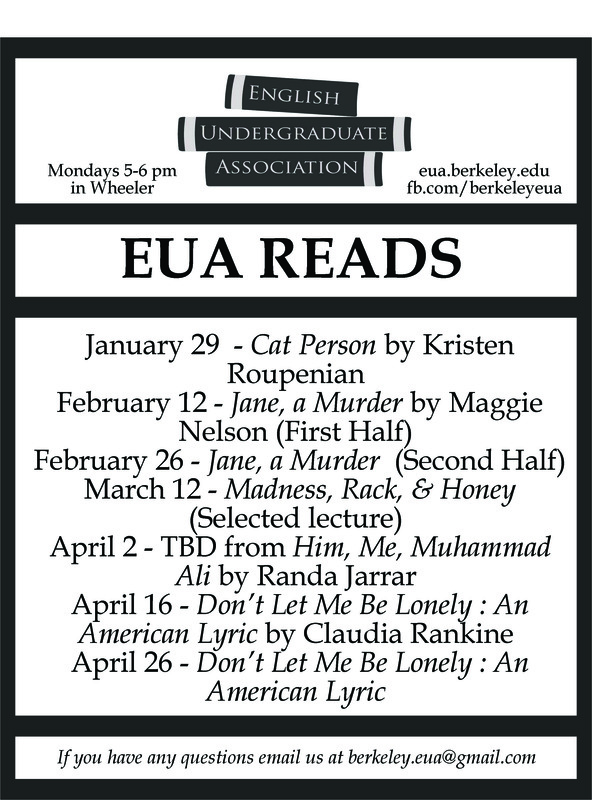 EUA Reads meets every other Monday in Wheeler 330, the Lounge from 5:00 – 6:00 pm. 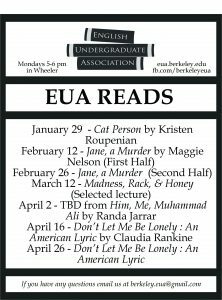 EUA Reads meets every other Monday in Wheeler 400 from 5:30 – 6:30 pm. No spoilers! Some texts span the course of a few book club meetings. We have page boundaries set in place in order to keep the reading load manageable; please respect these boundaries by not discussing any further in the book than the given meeting calls for. Be conscious of the environment. We are here to have fun. Please keep in mind how much you are speaking compared to others. Please keep your language accessible. Know your place, know the space. We’re going to be talking about serious topics that can be both divisive and emotional in nature. Please keep in mind that each individual does not necessarily have the experience or ability to speak on every subject, and that people in this space may be affected disproportionately by the issues we’re discussing when you speak! Keep it casual. We’re mostly English majors here, but try to give theory a rest for just an hour! No prejudiced language (racial, gendered, able-ist, sexuality-related slurs are not allowed!) Even if a text contains sensitive language, please try to keep your positionality in perspective. We want everyone to feel comfortable and safe.